Stephen Fry is a renowned English comedian, writer, and actor. To me, though, he will always remain Jeeves (from Jeeves and Wooster). I never see him as Stephen Fry, the actor, the individual, but quite simply as real-life Jeeves who acts in other roles. That’s how deluded I can be. I started reading P.G.Wodehouse around the same time that I started watching Jeeves and Wooster. 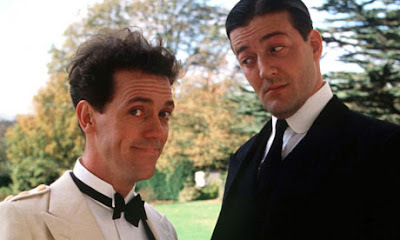 And it was one of those rare coincidences wherein my imagination of Jeeves and Bertie PERFECTLY matched the series portrayal of the characters through Stephen Fry and Hugh Laurie. One of the reasons why I flinch, “grieve” and vow never to watch “House” is because I can’t imagine dear, sweet Bertie (Hugh Laurie) as an eccentric doctor. Well, anyway, I therefore adore Stephen Fry (and Hugh Laurie) and have a special regard for them. Since I inflicted hours of torture upon my husband by making him watch Jeeves and Wooster, and A Bit of Fry & Laurie, he decided to get this book as a gift. I make his life so easy in the gift-giving department, despite his claims to the contrary. 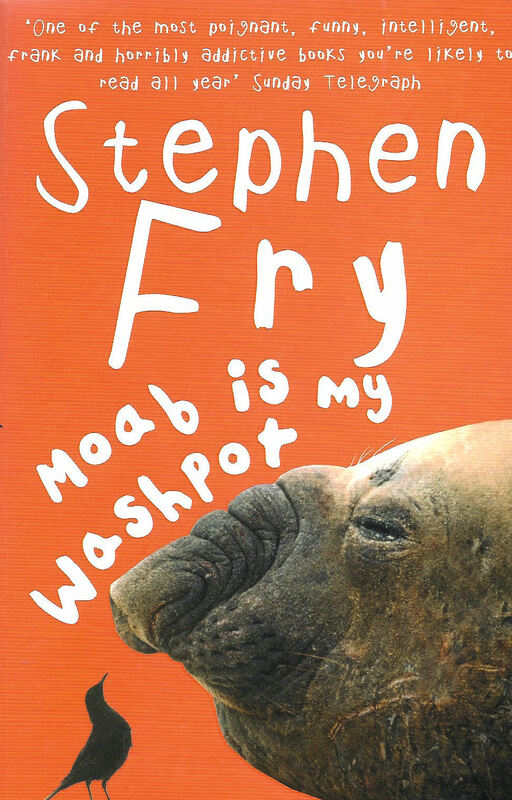 In this delightfully candid book, Stephen Fry recounts his life, views, turning points, and lessons learned in the first twenty years of his life. It was actually a bit unsettling to read the autobiography, for as I have been harping, it (rightfully) crumbled my deluded perceptions of Fry as being similar to Jeeves. Since I’m growing old and all that, I deserved the reality check, so I’m not complaining. But, he is similar to Jeeves on one major account - his language, his vocabulary, and his ability to play around with words with ease, wit, and sophistication. It warmed my heart to identify this, and that he too, like the fanatic that I am, adores P.G. Wodehouse. He collected and read all of his books, and even spent his time typing out entire P.G.W books for the fun of it! As a matter of fact, he regards P.G.W as a major influence in his life. We are kindred souls on that one. Since Stephen Fry’s voice and expressions are embedded in my mind (in those neurons that house Jeeves), I could hear his voice, his enunciation, and expressions throughout the book, making the narration more personable - and I enjoyed that part of the experience. His writing style in this book is quite chatty and informal, making it sound like he was sharing the interesting experiences of his troubled early life to a close friend True to the Wodehousian style of narration that drives some people up the wall, he jumps from one story to a sub-story, to numerous other diversions to explicate on his views on a certain subject etc., before he gets back to the initial thread. It didn’t unnerve me, and it surely wasn’t distracting or meandering. He had my attention through all the dozens of interludes and diverting streams of thoughts, because they were all interesting (to me) and were conveyed with humor, wit, and casual intelligence. Most of the autobiography details Fry’s tumultuous adolescent and teenage years during which time he was besotted with confusions and inner-struggles to find his true self. Despite his high intelligence, IQ, and academic success, Fry was disappointed that he wasn’t “healthy” as defined by the norms of school boys and headmasters. He hated sports with all his heart and was physically uncomfortable in his skin - from the way he looked to the dawning of his sexual orientation. So, he never fit in. A part of him didn’t want to fit in, but another part resented this as well. His views always seemed to be different - a bit more lateral, “skewed”, liberal, and slightly cynical. So, he rebels. His rebellion gets him expelled from different schools, pushes him further to rebel and lash out, until eventually a drastic turning point sets him free of his internal conflicts. He then goes on to study at Cambridge and makes a name for himself. His narration is extremely direct and candid, for as the title suggests, this entire experience of writing was his way of confronting, dealing with, and resolving the past. Like some of us, he too uses language and words as tools to think and feel. By walking down his painful and significant memories, he stumbles upon insights and revelations about himself and others in his life, thus gaining much needed understanding and closure from the emotionally-draining incidents. But this doesn’t make reading the book heavy and emotionally draining in any way - quite the contrary! There is a matter-of-fact, casual approach to his writing, and a self-deprecating humor and wit that make for easy reading. But there are glimmers of touching sensitivity and raw emotions in sudden corners of the book that elicits the reader’s sympathy and understanding. I enjoyed reading his analytical take on issues surrounding God, education, corporal punishment, intelligence, friendships, homosexuality, and love - among others. His views are mostly liberal and rational in nature, and I agreed with most of them. The prude in me was caught a little off-guard during instances of explicit ranting and cursing. But, I guess all of that is part of the candor of this book. In all, it was an interesting read. I haven't watched Jeeves and Wooster myself.. Thanks for the reco :-) I should give them a try :.. The only thing I've read by Stephen Fry is his tribute to Wodehouse in one of the collections ..And remember him being very candid there too..